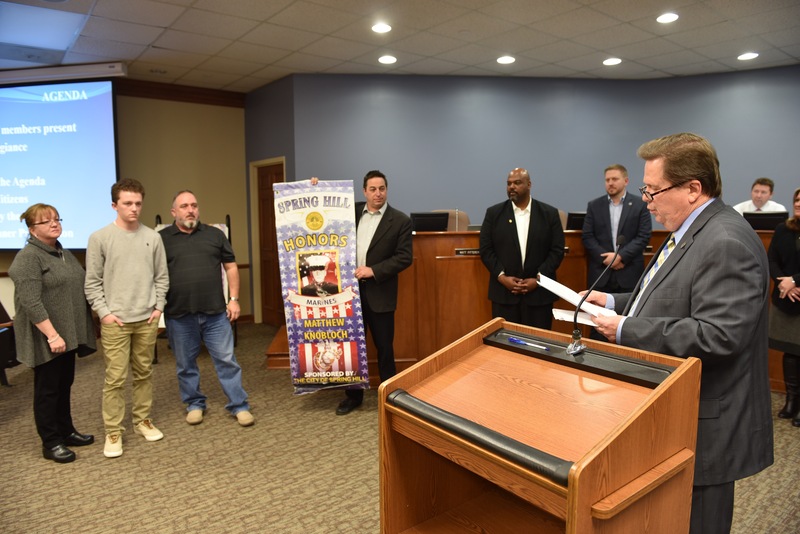 Mayor Rick Graham at the Feb. 21 Board of Mayor and Aldermen meeting presented four more retired City of Spring Hill military banners honoring: Austin Harrison, U.S. Navy; Bradley Johnson, U.S. Army; Matthew Knobloch, U.S. Marines; and Chris Rolon, U.S. Air Force. Spring Hill-based military service members are honored by the City of Spring Hill with a service banner displayed on utility poles. The banners are retired after two years and presented to the respective military members. Congratulations to all military service members honored at the board meeting. We thank you for your dedicated service.